NO BAKE SUMMER ORANGE CREAMSICLE CHEESECAKE – is a light dessert recipe that is perfect for summer. 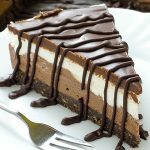 This amazing no bake cheesecake is sure to become your new favorite treat! 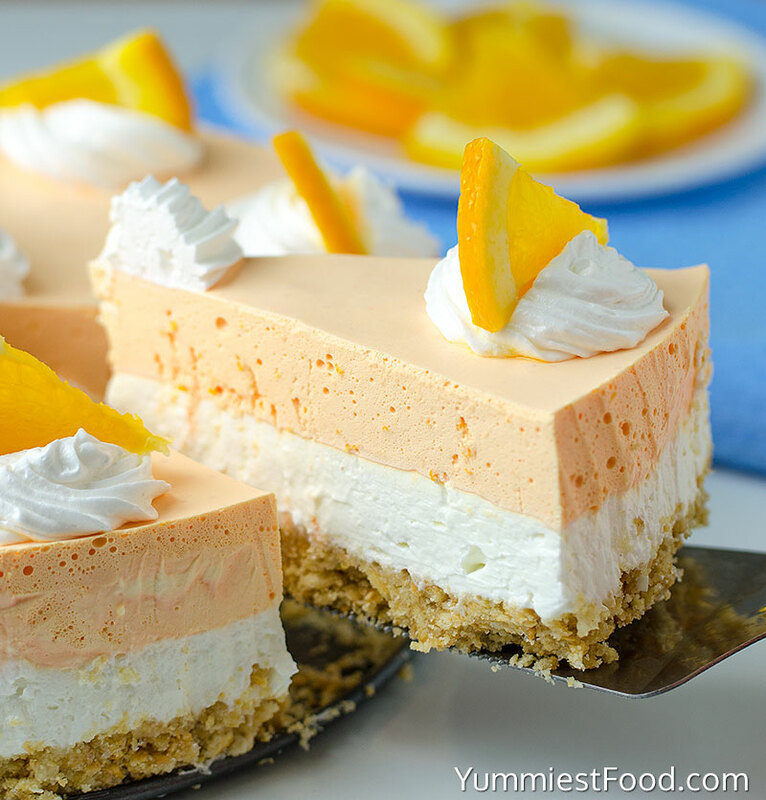 No Bake Summer Orange Creamsicle Cheesecake is one of my favorites for summer parties. You can make it easy and for a short time you can get perfect light taste. 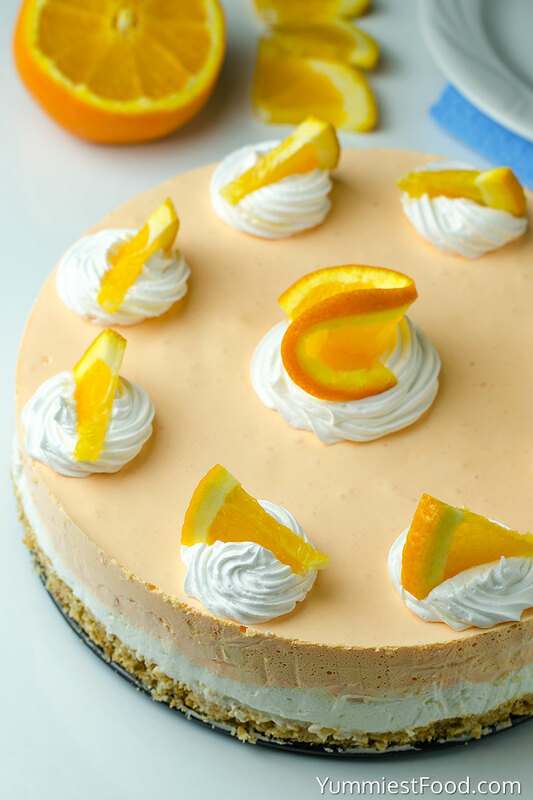 Moist, tangy and delicious this easy No Bake Summer Orange Creamsicle Cheesecake is perfect cake to celebrate the warm weather and family fun. I love orange and enjoy creating new recipe. For this cake I was inspired by the ever popular Orange Creamsicle. They are super easy to do and don’t take a lot of time. So grab up your ingredients and let’s get to make some fabulous orange creamsicle cheesecake. First of all is Golden Oreo crust. It is just simple mixture of Oreo crumbs and melted butter pressed in the bottom of the pan. Next layer is cream cheese mixture and then come the best part, light and fluffy orange layer. It is mixture of heavy whipped cream, orange Jello and orange zest. By the way, when the weather is warm no one likes to heat the oven, but we all love to enjoy delicious sweet treats. 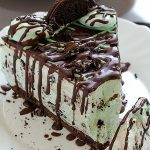 That is the reason why we looking for easy no bake desserts. 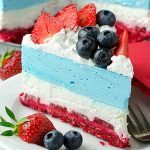 This time of year I am all about easy, fast no bake desserts. 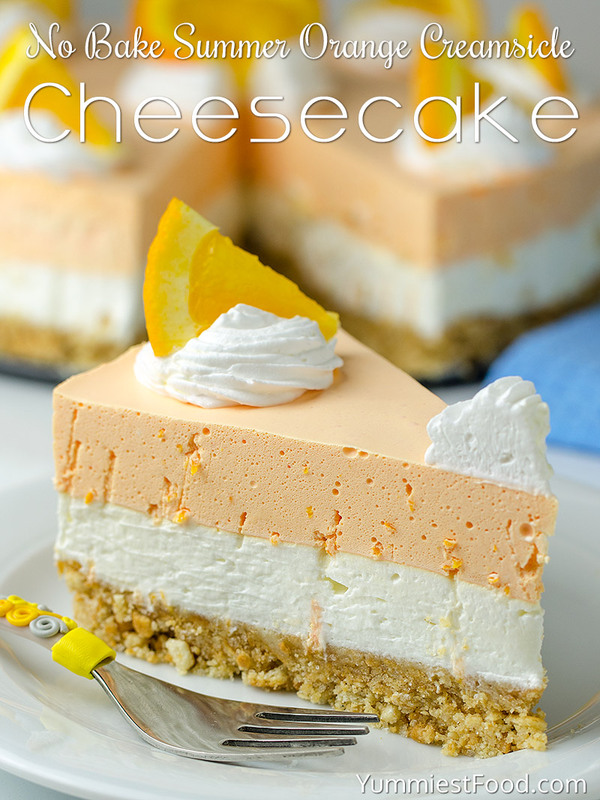 This creamy Summer Orange Creamsicle Cheesecake certainly fits the bill! It comes together in lest 20 minutes and is a real crowd pleaser. Don’t wait for a special reason to make this dessert, and certainly don’t wait years in between. 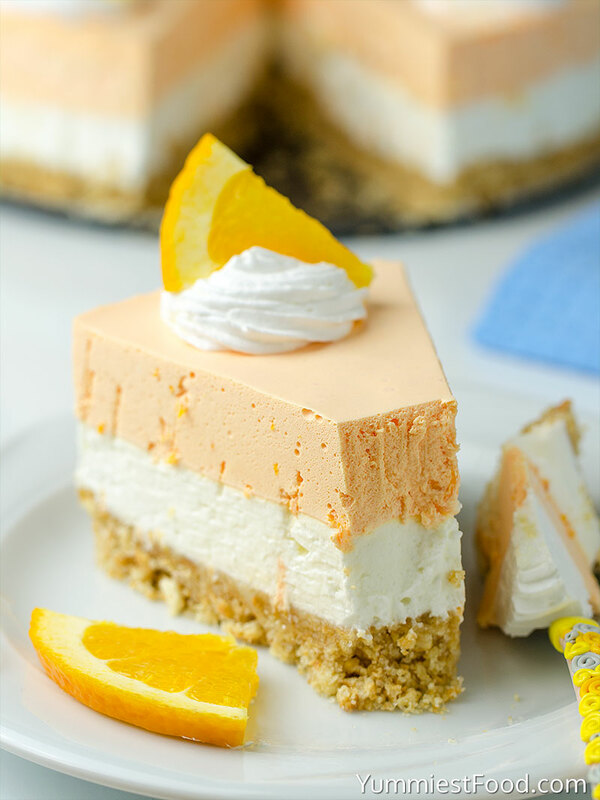 Any ordinary day is special enough for this incredibly easy No Bake Summer Orange Creamsicle Cheesecake dessert. Enjoy! NO BAKE SUMMER ORANGE CREAMSICLE CHEESECAKE - is a light dessert recipe that is perfect for summer. 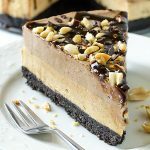 This amazing no bake cheesecake is sure to become your new favorite treat! Can I make in 9×13 pan? Hi Bonnie, Yes you can make in 9×13 pan. Enjoy! I’m relatively new at baking, so I’m just a little confused. You’re calling for Oreo cookies for the crust, but that l moremore like a Graham Cracker crust. Am I missing something?? Thanks!! My gelatin didn’t set. I mixed the jello powder directly with the boiling water. Did I miss something? I’ve never prepped gelatin before. Hi Luna, when you make the Jello, it’s super important to let the Jello to cool for about few minutes before you add the whipped cream. If you don’t let the Jello to cool, the cake will not set up and it will be very runny. Hope that helps! Listen, why not cut out the middle man by using good ole Cool Whip instead of whipping cream? Works just as well except no mixer needed and saves time. Hi Bobbye, you could certainly try it. Let me know how it goes! Orange creamsicle is the very best ever! It reminds me of being a kid again. I am so in love with this cake and its fun colors! I made this yesterday and it turned out lovely, refreshing and light and tasty. Like Bobbye suggested, I used Cool Whip instead of whipping heavy cream, which saved some time & effort and it worked well. It’s hard to know just how much to let the Jello/hot water cool down, so just a little of the orange mixture became a thin layer of “actual” jello just in the center. But that was okay, it kind of added another fun texture & look to the slice of cake. Thanks for a nice recipe! You’re welcome Elaine! 🙂 Thank you for such a nice comment! I’m glad that you like the recipe! The problem with Cool Whip is that it’s mostly oil and doesn’t work as well as the real deal. It only takes a few minutes to make the whipped cream and I think you’ll be happier with the results. Where can I find orange extract? Can I use something else if for some reason I can’t find it?